One of the great attractions of bridge is that no matter how much you play the game you are highly unlikely to ever see the same deal twice and there is always a new challenge to overcome. This intriguing hand was played in a match-point game at the Lake Chapala Duplicate Bridge Club in Riberas. North dealt and holding a nice 19 high card points opened the proceedings with 1 club. Although East had a six card heart suit, his paltry point count plus the unfavorable vulnerability persuaded him to pass. South had an interesting problem at this point. With a good six card diamond suit and a modest 5 card spade collection, his first inclination was to bid 1 diamond. But then, he thought, what would he do if North were to bid 1 no trump or 2 clubs? A rebid of 2 spades by South in either of those scenarios would be a gross overbid. So he bypassed diamonds to show his spade suit immediately. Curiously, like her partner, West also had a six card heart suit but she too was restrained from bidding by insufficient points and adverse vulnerability. North now reached into her bag of tricks and emerged with a bid of 4 hearts, a “splinter” bid showing the values for game (with at least four spades) but, more precisely, a singleton or void in hearts. South was momentarily stunned by this development as he also had extreme shortness in the heart suit. When he pulled himself together, he realized that his hand had grown significantly in stature so without further ado he jumped all the way to the small spade slam. West had a choice of leads and eventually picked her singleton club. When the dummy came into view, South saw that 6 spades was a very good contract but, this being a duplicate game, he strove to land an overtrick. 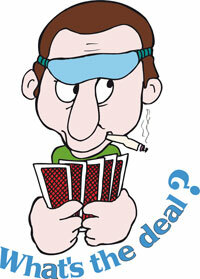 But first things first – declarer won the club lead in dummy and cashed the spade ace. He eyed the fall of the spade jack with interest but next cashed the heart ace to pitch his losing club. “No hearts partner?” asked North somewhat incredulously to which South answered in the affirmative. Declarer next played a small diamond from the dummy to his ace followed by a low spade to dummy’s 9, which held the trick. Now it was simple to draw the last trump and claim 13 tricks. The play of the spade 9 was not random or a lucky guess but an example of the Principle of Restricted Choice which states: If declarer is missing two touching cards and an opponent follows suit with one of them, the partner of that opponent is more likely to hold the other card.” The logic behind this may be difficult to understand, but it works like this: If East held the queen and jack, he had a choice of plays and might have played the queen; with a singleton jack he had no choice – therefore, the latter is more likely. Similar reasoning would apply if East played the queen on the first round. So this fascinating hand produced a top board for one pair who combined aggressive bidding with thoughtful play to achieve their goal.